One of the most common ‘derailers’ of a healthy lifestyle is traveling. We’ve all been there – crushing our healthy lifestyle, eating whole foods, hitting the gym regularly, and just plain feeling great. We are starting to see some inflammation and water retention subside, we are waking up with bountiful energy and we’re even getting to be early and sleeping through the night. Then the time comes when we have to put all of this ‘feel-good, health stuff’ on hold to travel for work or take a weekend vacation with your friends. A little moment of panic sets in because you know your steak is about to end – your sleep will suffer, digestion will be irregular, food quality won’t be a thing, and don’t even think you’re getting to the gym! Traveling can, indeed, bring us a lot of discomfort, but it can also bring us joy and build precious memories. Eating at restaurants doesn’t have to involve Bloomin’ Onions and late night Dairy Queen… Nor does it have to involve you weighing the salad croutons on your travel-sized scale. My hope is that you’ll follow a few of these mental practices and see if you can’t change the way you think about food and lifestyle habits while on the road. It might just be easier than you think! Ok this might seem a little over-simplistic. But who said that we need to eat any differently than we do at home? Assuming that you are eating an adequate amount of macros and micros for your body and activity level, there should be no reason you can’t continue that while on the road. + what time of the day do you eat each meal? + what foods does each meal usually consist of? + what food pairings do you like at each meal? 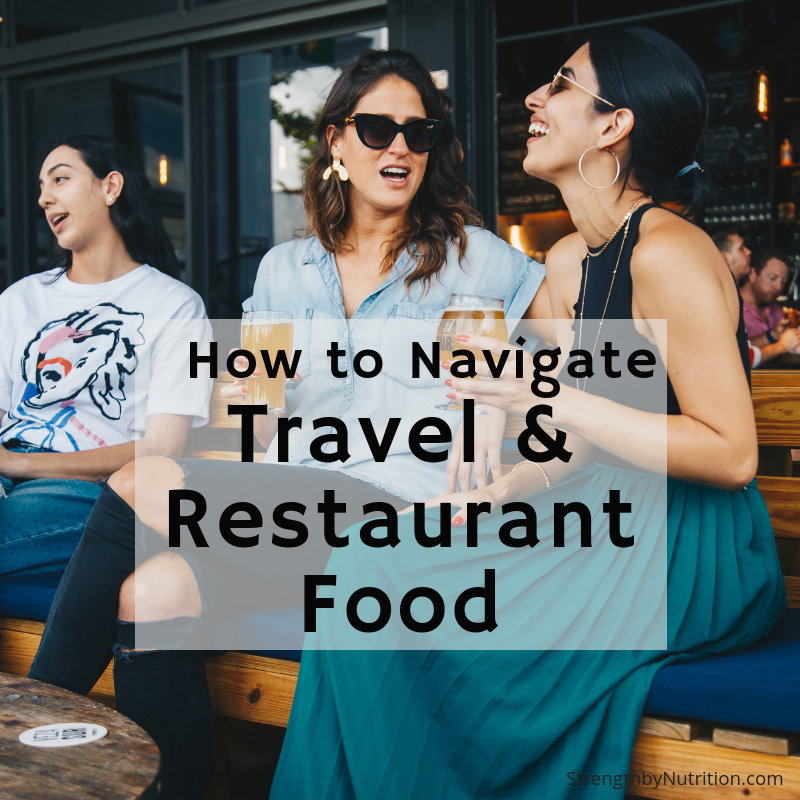 While these may seem very simple, they can provide a very solid foundation of how you can eat while traveling. First – why alter when you eat while traveling? Within about 30-60 minutes, you will likely be able to eat at the same times each day. If I always eat breakfast within an hour of waking up, then I’m going to make sure I do the same when traveling. None of this waiting until 11am BS in order to binge on brunch food. At least pack some oats, fruit, even a protein bar to eat when you wakeup. Second – you likely eat the same types of foods at each meal. For example, if you have eggs and oatmeal in the morning and you know that makes you feel great, then order that for breakfast. If you thrive off a chicken salad with a little avocado for lunch, then order something similar to that. If you know that you sleep well with a belly full of white rice, order that for dinner. Third – you likely pair certain foods together to make a complete meal. Using the example above, eggs and oatmeal for breakfast; chicken, salad, and avocado for lunch; beef and rice for dinner – this equates to protein + carb, protein + fat, and protein + carb. You can order eggs almost anywhere in the morning, and you could have a banana or bagel in place of oatmeal – that would be protein + carb. Repeat the same for lunch and dinner. Now will this be EXACTLY the portion size that you are used to at home? NOPE, but at least you are going to stay regular in your energy and digestion. If you have the luxury of hitting the gym while traveling, or perhaps you are doing something active like skiing or snowshoeing a mountain, then consider timing specific nutrients around that workout. For example, if you are waking up early to drop in on a CrossFit class then eat the majority of your carbs for dinner the night before you workout and for breakfast meal after. These are the times that you are most insulin sensitive – or the times that you will use these carbs for fuel and glycogen, rather than fat storage. If you aren’t training or doing anything active while on vacation, you can decrease overall carb intake. Anywhere from 20-100g per day. Just depends on how high your carbs were before the trip and how long you will be inactive on the trip. I personally like to keep carb intake pretty low throughout the day and have more flexibility for dinner. Likely you’ll be eating out for dinner as well. You won’t want to be the person munching on a salad while every one else is sharing their favorite plates and desserts. With that said, this is not a reason to completely ditch your diet and training. Nor is it a reason to obsess about everything that you are consuming. I’m a big proponent of sustainable, flexible, healthy habits – none of which involve packing a food scale in your purse. Sure, you’re going to feel better with steps 1 and 2, but you’re still going to notice some fluctuation. And for that, you never want to weigh yourself or assess progress the day you get back from a trip. I’d wait at least 3-4 days before hopping on the scale or trying to squeeze into your skinny jeans. The stress and exhaustion of travel is real. Physically it is demanding with the sitting and lack of sleep. Mentally it can be exhausting with the flight connections, sleeping arrangements, meetings, etc. And even emotionally wearing due to homesickness, loneliness, and missing family. But hopefully we’ve helped you reduce the stress around food while you travel in 2019! Happy travels!